So....something happened on December 20th. I was perusing my google reader when I happened upon two similar posts by Effortless Style and One Love. 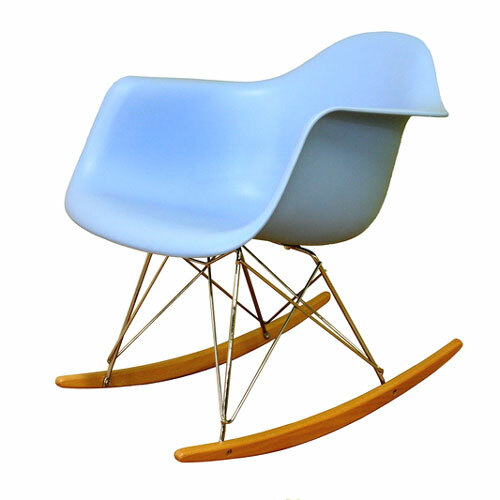 It was about the deal of the day at HauteLook, a reproduction Eames rocker for $79 plus $20 shipping. I have never really lusted over this chair, or a rocker version for that matter, but the thought of owning a reproduction of something that had such a cool history in design really appealed to me, so I whipped out my credit card before the deal expired in a couple hours. Considering this same item was more than 5 times that price everywhere else, it seemed like a great opportunity to own this interesting piece! Then I kind of forgot that I ordered it. It came unannounced in mid-January in a huge box on our front porch. It's hanging out in the living room right now, I added the Crate and Barrel throw because without it, the men in my life seem to think it looks like a handicap chair for the shower. Ouch! My thoughts: this chair is not very comfy to sit in. I probably wouldn't offer it up as a seat to a guest. But, it looks cool and will be good for a modern nursery someday, so that is where it will most likely end up. Would I buy it again? Probably, just for the fact that it's a great conversation piece. And for under $100, I consider it a cool accessory. Anyone else buy the HauteLook deal of the day? Didn't get one myself, but they have some options of this style on Overstock. Stop by my blog - there's a coupon code for 10% off any overstock purchase! It does look GREAT with your floor and that throw draped over it. It is a really cool chair. I've seen them in nurseries quite a bit and think they are pretty cute, but not sure if they are for me. But I do love the way it looks, and it looks great in your house! I bought one too! I have always wanted one. It is still in it's box at my office though...the husband may not know about it's existence since he said I can't buy anything until we move :) But it was a great deal that I couldn't pass up. I can wait to move and get it set up, though since it's a rocker, I think I will need to buy an ottoman for it, so your legs on it can stabilize you. Will be going in our future nursery as well. What a great chair. I don't have one myself but I have never even seen anything like it before. I bought one from that same sale. Mine is white as well. I love blue and green, but I didn't like the way they looked online. I've sat in it once or twice and it was okay. I threw a small pillow in it. It looks cute sitting in a corner that was previously sad and empty. I've been eyeing it but missed the HauteLook sale. One day I will find one in perfect condition on the side of the street. I can dream! never been on hautelook...but i think i need to change that! It is SUCH a good bandwagon to jump onto. Better than - say - striped leg warmers. I have been wanting a Eame's rocker, but I had heard they weren't very comfy :( I kind of really, really want some of the dowel leg shell chairs, though. I like the chair! Plus, even if it's not too comfortable to sit in, sometimes a girl's just gotta have a statement piece, right? This is very cool and a great price. It's definitely not something I'd choose at full price, but it's a total conversation piece. I really like the throw, too. I bought the same chair off of the HauteLook deal!!! (http://www.tenjuneblog.com/2011/01/im-so-excited-i-could-screames.html). Wow we really must have similar taste- Moorish Tile, now this. Love it, girl! Ha! I'm on the bandwagon too...I love the shape of the chairs, but I've never actually sat in one. I am sad to hear they are uncomfortable, since I was contemplating one for the kids room. These chairs are really beautiful but what I really love is that throw, the color is amazing! Details on where it's from? I am extremely envious. Everytime I watch Dear Genavivie (sp?) on HGTV and this is on the end I am like I WANT THAT ROCKER! what a great deal!